How popular is your element? XKCD’s latest is a calendar of meaningful dates based upon how often a date is represented in English-language books since 2000. Anders Sandberg, a neuroscientist at Oxford University, has taken inspiration from that calender and his love for yttrium to construct a new kind of periodic table. 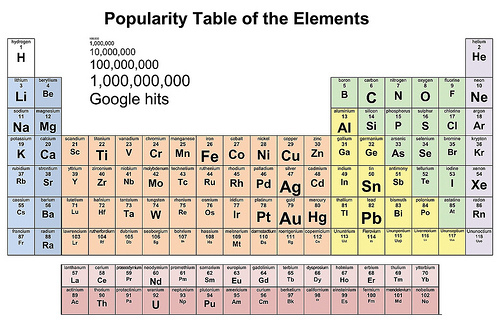 It’s based on how popular each element is on the interweb (roughly based on Google search hits). Most popular were, perhaps unsurprisingly, gold (2.7 billion) and silver (1.9 billion). Lead got into third place (1.4 billion), perhaps due to the fairly common verb “to lead” rather than its heavy charisma. Why tin is so popular (1.1 billion) beats me. Least popular are the transuranians, with Bohrium (40,600), Livermorium (106,000) and Flerovium (118,000) as the least popular. These might suffer a bit because they are recently named and people might still remember them with their old names. But they are still fairly obscure outside connoisseurs of heavy nuclei. Why Meitnerium is so popular compared to the others also beats me. Robert Munafo, an independent American researcher, points out that tin’s popularity might be down to its usage in Vietnamese. Of course, as Anders accepts, his algorithm based on two hours of work isn’t perfect. There may be a way to semantically weed out non-elemental usage of these words, and I do hope that someone starts working on that. Till then, I take solace in the fact that Osmium seems to be doing just as well as Polonium and Thorium. How is your favourite element doing? PS: Here is a large PDF/JPG of the table. I think this has some potential. Sandberg didn’t really discuss the results but perhaps people should. I noticed that most of the noble gases are quite prominently featured. Wonder why. Silicon isn’t doing too badly either although I would’ve thought that it’d do better. Can this be correlated with the fact that it’s not living up to its recent hype (the new organic-like field)? Some interesting questions! I expect Meitnerium is popular due to the historical significance of its naming. Lise Meitner was a woman, Jew, and physicist whose research in Nazi Germany lead to the discovery of nuclear fission. For political/sexist reasons her lab partner, Otto Hahn got credit for the discovery. After the war, an element was named after Meitner since she didn’t get credit for her discovery. Kind of a cool story, and probably told a bit more than some of the other elements in that area of the table. Tin is likely popular because it is also used as an acronym for Tax Identification Number (used for tax purposes in the United States), Triangulated Irregular Network (a digital data structure), and is a common surname. Tin: think cans. and foil. What I find truly amazing is that on Googleing the word “elements” I got just under 700 million hits! Now what should that be attributed to other than the fact that elements and the periodic table are now the coolest meme in town. Its finally OK to talk about such things in polite company after so many years in the closet. Oh and my favorite element – hafnium, because of the story of its discovery which I tell in my forthcoming book from OUP, A Tale of Seven Elements, along with several other reasons.